We had a busy and fun weekend that included Sunday brunch to celebrate my dear sister’s birthday. She was not supposed to be in town so it was rather last minute and it turned into quite the unplanned feast with friends. Perfect for a Sunday afternoon! So, last night I wanted to make a simple dinner, as I had dishes to wash, dogs to walk, and was kind of wiped out. 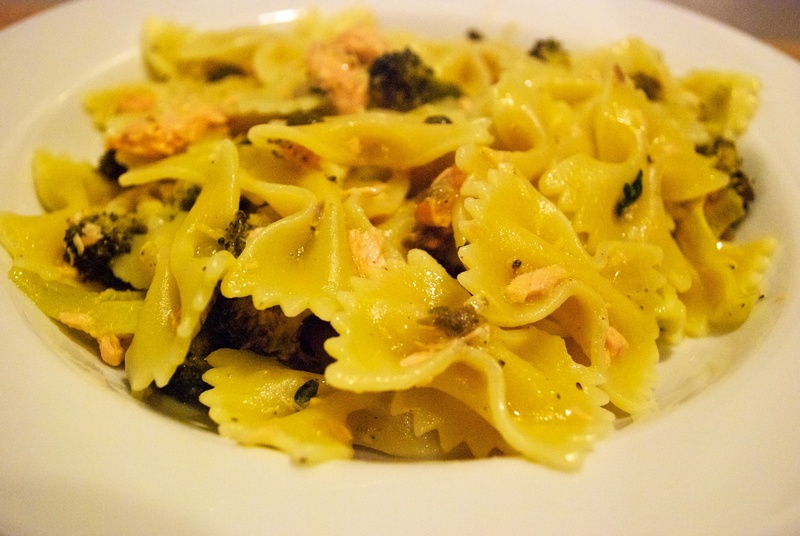 I had some leftover baked king salmon from dinner Friday night and more from the brunch. I also had some broccoli that needed to be used up. So, I made a quick and simple pasta sauce. I think it’s great to make meals with leftovers. Meals using leftovers are generally simple to do and they feel good! You use up your leftovers and you don’t have to eat the same thing again and again. Perfect. What do you do to reinvent leftovers? This sauce only takes a short time to cook, so I would suggest putting your water on for the pasta when you start cooking the sauce. Coat a pan with olive oil and saute chopped garlic and olive oil. Meanwhile break the broccoli flower apart and cut the floret’s in half or thirds length wise. Once the garlic and onion is translucent, add about a half a cup of dry white white wine. Let it cook for a few minutes before adding the broccoli. Add the capers and the juice of two lemons. By now your water should be boiling, add the pasta. Right before straining the pasta, add a couple ladles full of pasta water to the sauce. Strain the pasta and drizzle with olive oil. Add the leftover salmon to the sauce. Combine the pasta and the sauce, add the greens of a few sprigs of fresh thyme and salt and pepper to taste. Mix together and serve. The other night we had a little dinner party at our house and our friend Katie brought up Risotto she had made. Katie makes great Risotto and this was no exception, it was awesome and there was lots of it! Thank you, Katie! I have been wanting to make Arancini balls for quite some time, but I so rarely make Risotto, that I hadn’t gotten around to it. Good news for me: Katie left us with the leftover Risotto, the main ingredient for Arancini. 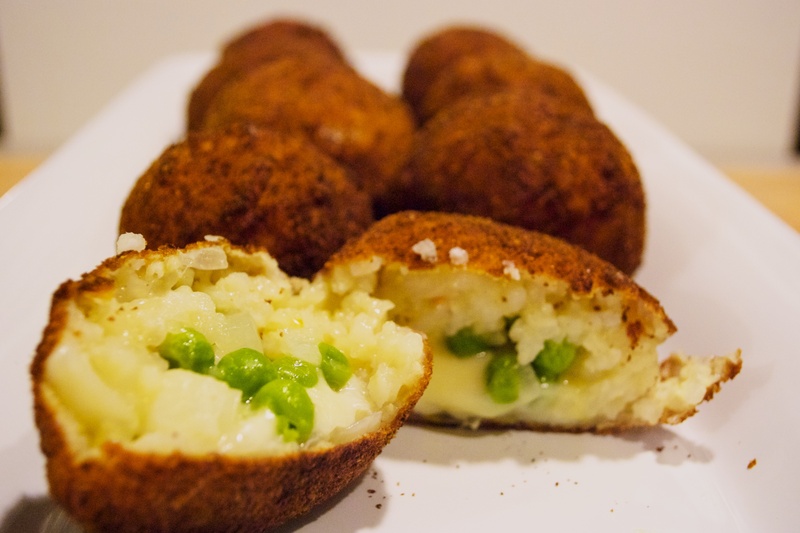 Arancini are fried balls of rice, stuffed with whatever you like. They are so good and as it turns out, really fun to make! Some people make it all from scratch, but I think leftover Risotto is the perfect thing to use for this. I did a very basic stuffing, but next time I will experiment more. I am thinking blue cheese, mushrooms and caramelized onions. Mmmm. Lay out a sheet of parchment paper on a cookie sheet. Form the leftover Risotto into fairly good sized balls, using about a half a cup of rice for each ball. Push a hole into the middle with your thumb and shove in whatever you’d like to find in the middle of your fried goodness. Like I said above, I used mozzarella and peas, but you can use meat, more flavorful cheese, whatever you like. Once you’ve stuffed them and closed them back up into a nice ball, place on cookie sheet. I found that if my hands were wet when I rolled the balls, it was easier. Once you have made all the balls, put in the fridge for an hour or so. Before you take the balls out of the fridge, get your breading goods together. I used three pasta bowls. One for flour, one for eggs (well whipped with a fork) and one for bread crumbs. Roll the balls through each in that order, letting the extra egg drip off before rolling in the bread crumbs. I stopped and cleaned off my hands a couple of times. Use a deep pan to heat up your oil, you want it to be enough oil to easily cover the balls (I cooked 2 at a time), about 4 inches worth. Heat the oil to 375 degrees. When I fry things (which I don’t do very often) I like to let the oil strain off in a wooden bowl lined with paper towels, but you can get a plate or whatever and line it with paper towels. Once you’re all ready, put your first ball of goodness in the oil. I cooked them two at a time. After about 3 minutes, when they’re a nice golden brown, remove and put on the paper towel. 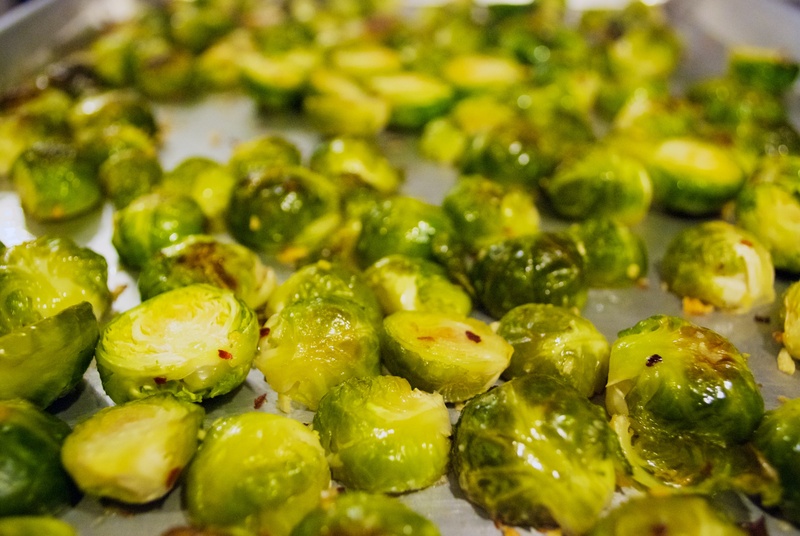 Eat them while they’re still warm. You can serve them with marinara sauce or anything else you like! Just enjoy immediately. Fun and yummy! Figs are still in the grocery stores. They are so yummy and there are endless things you can do with them. I have only started playing with figs in the kitchen over the past couple years. 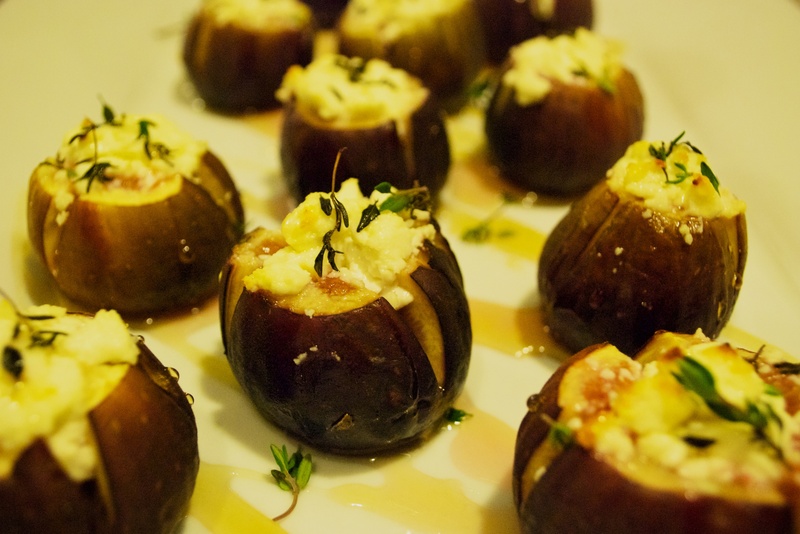 I have found a few recipes on line for roasting figs with goat cheese with a variety of other ingredients. I really like thyme with goat cheese and I generally have good honey on hand. So, the other night I made this appetizer to share with some friends coming for dinner. It was quick, easy and good. Preheat oven to 400 degrees. Rinse figs and cut off the tops. Slice an X in the top of the figs, going fairly deeply into the fig. Stuff each fig with a goat cheese (about a teaspoon’s worth in each fig). Drizzle olive oil into a baking dish. Put each stuffed fig in the dish, drizzle with olive oil and sprinkle with fresh thyme. Bake for about 10-15 minutes or until the figs have started to get soft and juicy. Remove and transfer to a platter drizzled with honey. Drizzle more honey over the top of the figs and add more fresh thyme. Serve alone or with a sliced fresh baguette. If you serve with a baguette, the entire fig can be smeared across the bread. Otherwise, you can just pop the whole figs right in your mouth. One of the best parts of serving with bread is to use the bread to soak up the honey and the juices from the figs on the plate. YUM! There are so many delicious ways to stuff peppers. The little boats that half peppers make are perfect for filling with various ingredients to make a simple meal with so much flavor. I make stuffed peppers a few different ways. 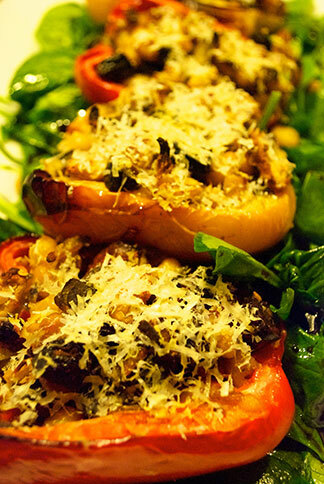 This recipe with Cannellini beans makes a yummy vegetarian dinner with plenty of protein. Preheat oven to 400 degrees. In a large and deep sided pan, saute onion and 4 cloves garlic in olive oil. Add the zucchini and mushrooms and let cook. Add the olives, sun dried tomatoes and beans. Stir all together and add the red pepper (if you don’t like heat you can add less, this will give it a nice kick though), oregano, capers, a handful of freshly chopped basil, a couple pinches of sea salt, and stir all together. Let cook for 5 minutes or so and turn off heat. Cut your bell peppers in half and remove seeds and core. Drizzle a small amount of olive oil in the bottom of your baking dishes (you’ll probably need two). Stuff each half of the pepper with as much of the filling as you can fit in. You don’t want it overflowing much though, because it will just fall out. Cover with aluminum foil and put in the oven for 20 minutes. After 20 minutes, remove the foil and cook for another 20-30 minutes or until the peppers are soft and roasted. Sprinkle the peppers with fresh grated parmesan cheese. In a large saute pan, saute one clove of garlic in olive oil. Add about one large handful of fresh spinach for each half pepper you have, saute briefly, just long enough to slightly wilt the spinach. Transfer the spinach to a large platter and drizzle with good balsamic vinegar. Place the stuffed peppers on top. Enjoy! As I mentioned earlier on this blog, we have chickens in our yard here in downtown Juneau. They are so much fun and they are laying eggs like crazy right now, which is awesome. Because of this, I am making a lot of meals and snacks using the eggs. I also have a lot of cherry tomatoes that I grew in my house. So, I made this for dinner the other day. It was quick and yummy. Try it! Pit and slice the avocado into about one inch chunks. Put in a bowl. Slice the handful of cherry tomatoes in half and add to the avocado, squeeze in the juice of the lemon. Drizzle with olive oil and sprinkle with salt and pepper. Toss together. While that is sitting, poach an egg. 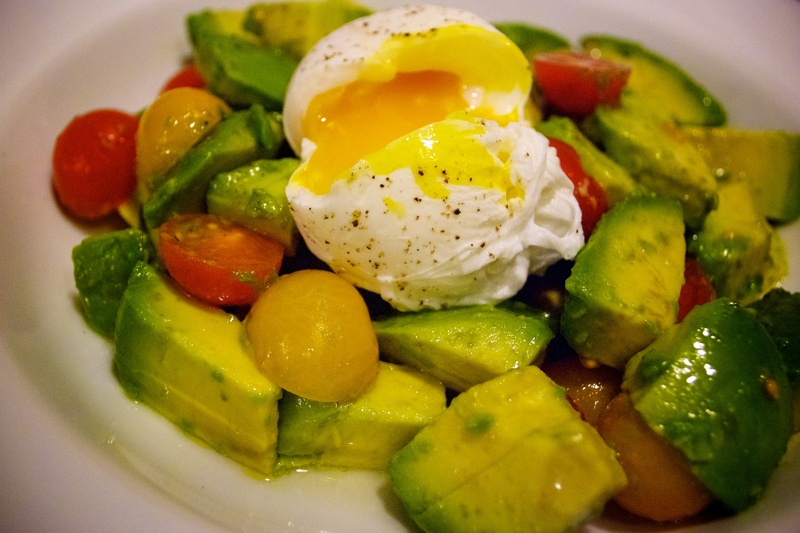 If you have never poached an egg, there are instructions in this post. Once egg is finished place on top of salad, sprinkle with a bit of salt and pepper. Let sit to cool down for a minute or so and enjoy! The whole thing will take you 10 minutes or less. A great lunch or light dinner. It’s Friday, friends, another week down. Seems like a great time to enjoy a whiskey sour with some pals! I am a traditionalist when it comes to whiskey sours, which means, I like them with egg whites. It’s rare to find whiskey sours with egg whites in bars these days, I imagine it’s just a pain for the bartenders. With all the fresh eggs we have from our chickens I thought it was time to try making them at home. I decided to use Meyer lemons because they are so extra delicious and we happened to have some on hand. Here is how I did it, and if I do say so myself, they were pretty darn good! Fill a cocktail shaker about 3/4 full with ice. Add the bourbon, lemon juice, simple syrup and egg white. Shake vigorously for about a minute. Mixing it well will meld the flavors as well as make the egg nice and foamy, adding a creamy texture to the drinks. Strain into a chilled glass and serve immediately. SO good! 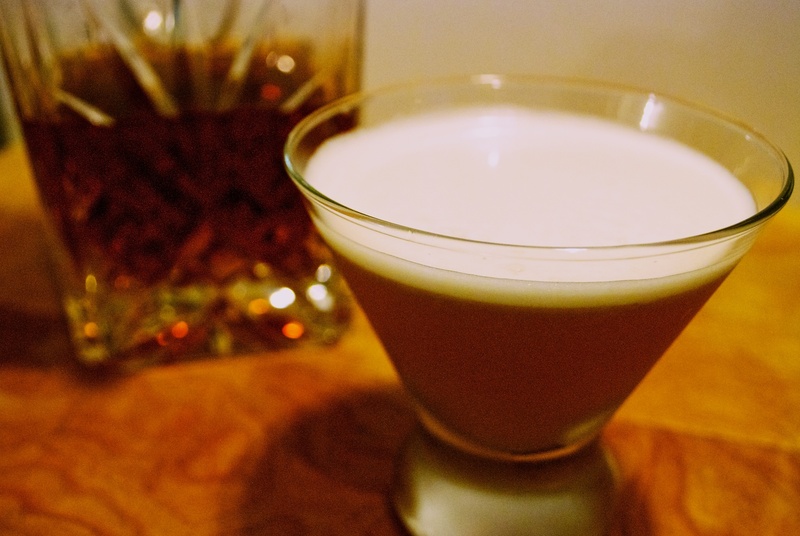 Traditionally whiskey sours are garnished with a maraschino cherry, so if you’re inclined… Also if using raw egg whites freaks you out, then don’t. If you choose not to use the egg, cut back a bit on the simple syrup, as the egg does make sure it’s not too sweet. The drinks will still be yummy without them, just not creamy. Quinoa is a delicious grain-like seed that is a complete protein and is so good for you. It’s also super easy to cook, yummy alone with a little olive oil or soy sauce drizzled on it, and great as the base for a salad. I use it in lots of different ways. One of which is the recipe that follows. It takes no time to prepare and makes for a great lunch salad. I like the curry in this recipe cause it gives it a little kick. Start with cooking the quinoa. If you’ve never done this before it’s very easy and only takes 10-15 minutes or so. You cook quinoa the same way you cook rice. Put two parts water to one part quinoa in a small pot over high heat. Once the water boils, turn it down to very low. Turn off when all the water has evaporated, the quinoa will more than double in size in the pot. While the quinoa is cooking, chop the zucchini up into small pieces and saute in a pan with a little olive oil. 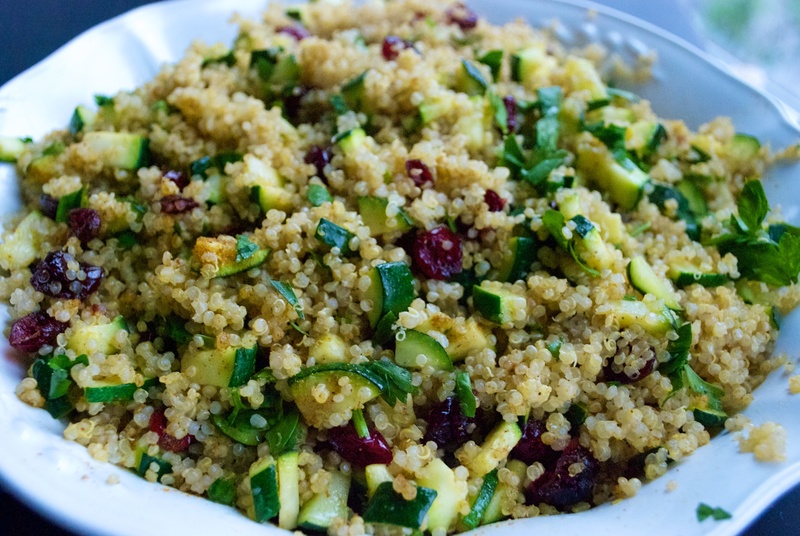 When the quinoa is cooked, transfer to a bowl and drizzle with olive oil. Add the cooked zucchini and the dried cranberries. Mix in approx. one tbs of curry powder and a handful of chopped fresh parsley. You can eat right away, or refrigerate and enjoy later. This is great to bring to work for lunch. If you double the recipe you can have lunch all week. Healthy and so easy!